This evening I had the mixed pleasure of heading up Shutlingsloe hill in perfect English spring weather, but with a 36 kilo pack on my pack. Final stats: 36 kilos up in from car park in 59 minutes, back down with ~22 kilos in 35 minutes. The purpose of dropping the extra weight on the descent is to save my knees from unnecessary pounding whilst training… I only have 2 weeks’ of training before my Denali expedition. The best way I have found to drop that weight at the top of the hill is to carry water bottles up and empty them at the top. 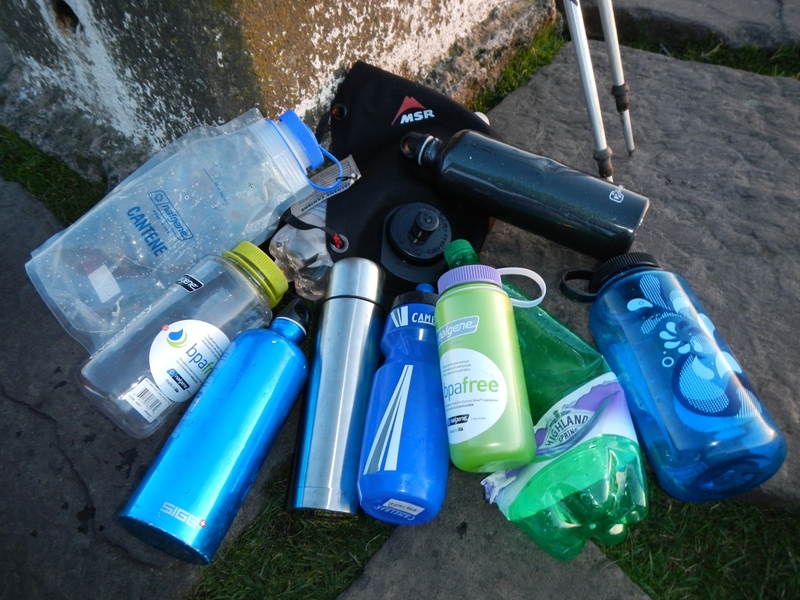 At the top of the hill this evening, I performed the water-shedding exercise, and noticed that I was carrying at least one hundred pounds worth of water vessels! MSR Dromedary hydration bag, 2 litres (~£20): this is super sturdy, has three pouring/filling mechanisms, and I prefer this to Camelbak offerings because it has never leaked/burst despite hard usage. Hi-Gear metal water bottle, (~£5): cheap and cheerful, I used to have two of these but one split open when the contents froze in Scotland two winters ago, indicating it may not be made as sturdy as the Sigg bottle or the Nalgenes. This has no special coating on the inside- it can taint drinks’ flavours. It has a narrow opening making it relatively harder to fill compared to some of Nalgene’s offerings. Blue Nalgene 1 litre wide neck bottle. (~£11): Very sturdy, treated so it does not taint the flavour of drinks, and I can use it with the Outdoor Research water bottle parka in cold conditions. A wide neck is a real boon when filling up using a ladle or when time is of the essence. Used water bottle, Highland Spring! : Not a good idea for expeditions. Narrow neck makes water filling complicated. This bottle was never designed for multiple use. Don’t be surprised if this gets pierced in a big pack. Nalgene 500ml bottle (~£10): Wide neck again, great little bottle and very sturdy. I have another Nalgene 500ml bottle, not wide neck. It has been relegated to whisky carrying duties as the narrow neck is no good for a cold weather expedition. Camelbak Podium bottle, 610ml (~£8). This bottle fills quick and has a simple locking mechanism with a sports nozzle (they call it a Jet Valve). It is treated to not taint drinks (BPA-free again). However, this bottle does leak around the cap when under stress, from time to time. Fine for cycling but no good in a backpack or even on the outside of one. Unless you know this bottle is upright, don’t trust this one. Helly Hansen 500ml thermos (freebie): A thermos is great for cold weather days when you need a pick-me-up after hard exertion in the cold. However, it is bulky and heavy given the volume of liquid it holds. I would not take this on my Denali expedition, but for trips where weight is not such an issue this is a nice luxury. Sigg metal water bottle, 1 litre (~£15): This bottle has taken some beating. The inside is coated to prevent tainting of the drink’s flavour. Noteably if filling it with acidic fruit juice, it won’t react with the metal. I think you pay a premium for the brand name, so you may as well get a design that matches your style! Clear Nalgene bottle, 1 litre (~£11): Testament to how much I like these bottles, here is another one.